Analysis: Powell earned multiple targets for a second consecutive week in Bruce Ellington's (hamstring) absence. However, both Andy Jones and TJ Jones saw significantly more targets and snaps than Powell behind entrenched No. 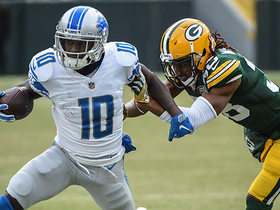 1 wideout Kenny Golladay, making Powell a risky fantasy options even in the deepest of leagues when the Lions reconvene for the team's Week 17 season finale against the Packers. Analysis: In Bruce Ellington's (hamstring) absence, Andy Jones (45 snaps) and TJ Jones (36) saw much more playing time than Powell (12). While Powell saw just as much action in the passing game as either of them, none of the trio were given the opportunities on offense to make game-breaking plays. It'll continue to be hard to trust any Lions wideout not named Kenny Golladay over the final two weeks of the 2018 season. Analysis: Powell has missed the last two games with the calf issue but appears healthy heading into Week 15. The 22-year-old was a healthy scratch for the previous two games before suffering the calf injury, so he may not have been a factor offensively regardless. Bruce Ellington sustained a hamstring injury in Sunday's win over the Cardinals and didn't practice Wednesday, which could provide an opportunity for Powell should Ellington miss any time. Analysis: Powell will miss his third straight game. He likely would not have been a factor in the offense had he been active, as he is buried on the depth chart. Analysis: Powell was a full participant at practice Thursday but regressed to limited participation Friday to earn the questionable tag. The 22-year-old is unlikely to be involved offensively regardless, as he was a healthy inactive the week prior to suffering the calf injury in late November. Powell (calf) was a full participant in Thursday's practice. Analysis: Powell was limited in practice to begin the week, but he now appears on track to suit up against the Cardinals in Week 14. The undrafted rookie has only caught one pass for six yards this season, but he could be in line for notable targets Week 14 with Kenny Golladay (quadriceps) and Bruce Ellington (back) both nursing injuries. Powell (calf) was a limited participant in Wednesday's practice. Analysis: Powell has not seen the field since Week 10, and is still nursing a lingering calf issue. 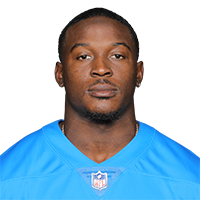 With Kenny Golladay (quadriceps) and Bruce Ellington (back) both managing injuries, Powell could see an uptick in offensive snaps if he's able to get healthy in time to play against the Cardinals on Sunday. Powell (calf) is ruled out for Sunday's game against the Rams. Analysis: Powell did not practice Friday, and will remain sidelined Week 13 as he manages a calf injury. The undrafted rookie's lack of availability is unlikely to hamper Detroit's passing attack in any way, given that he's been a healthy scratch for two straight games. Powell (calf) was a limited participant in Thursday's practice. Analysis: Powell was not listed on Detroit's injury report to begin the week, so it remains to be seen where he picked up his calf injury. The undrafted rookie has been a healthy scratch for two straight games, and he's unlikely to see a notable offensive role against the Rams on Sunday even if he's able to suit up. Powell (coach's decision) is inactive for Thursday's game against the Bears, Tim Twentyman of the Lions' official site reports. Analysis: Powell appeared in three consecutive contests before being listed as a healthy scratch prior to Sunday's win over the Panthers, and he'll once again be held out as the Lions roll with Bruce Ellington, TJ Jones and Andy Jones behind Kenny Golladay at receiver. Powell (coach's decision) is inactive for Sunday's game against the Panthers, Kyle Meinke of MLive.com reports. 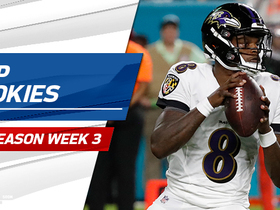 Powell caught one of three targets for six yards during Sunday's 34-22 loss to Chicago. Analysis: Unlike last week's game against the Vikings, Powell actually had a tangible role on offense and earned more targets than T.J. Jones, who caught one of two passes for 12 yards on the day. However, Powell still isn't seeing the type of involvement that would warrant serious fantasy attention. With Bruce Ellington, who signed with Detroit earlier in the week, a significant threat to steal some of his playing time in the short term, it doesn't seem like Powell's status will change anytime soon. Powell did not log an offensive snap during Sunday's 24-9 loss to Minnesota.